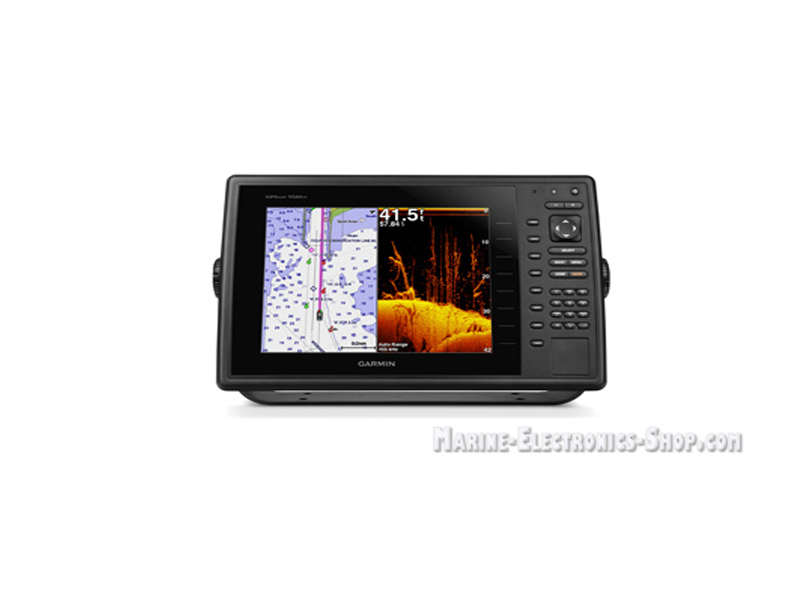 Garmin GPSMAP 1020xs chartplotter and depth sonar has a ten-color SVGA display, includes integrated functionality CHIRP, HD-ID, DownVü with CHIRP sonar. GPSMAP 1020xs offers media integration, compatibility with autopilot, radar support, the connection over a wireless network and a NMEA 2000 network. Garmin GPSMAP 1020xs allows you to select which information to display on the screen, whether it is GPS-speed or time of day. Sonar device has the ability to record information and then to preform a play-back on a computer using HomePort software. Built-in high-sensitivity 10Hz GPS / GLONASS downloads updates the position and direction of travel ten times / sec. with great precision of navigation and marked waypoints. GPSMAP 1020xs also offers you to select networking capabilities that allow you to share features with other compatible GPSMAP units. Garmin GPSMAP 1020xs model has a build-in sonar functions whish allow you to use one of several additional transducers, including traditional, CHIRP and versatile scanning sonar HD-ID / DownVü with CHIRP technology. For scanning sonar and DownVü SideVü ™ with CHIRP technology, you can add sonar unit "black box» GCV ™ 10 (sold separately). When GPSMAP 1020xs is used with a compatible transducer CHIRP (sold separately) GPSMAP 1020xs device provides crystal-clear and detailed image of fishing areas, underwater debris and diving spots. Thanks to Garmin CHIRP technology achieved excellent target separation and a high level of resolution even at great depths. Due to the use of certain frequencies it becomes possible to detect the desired species of fish. The contours of the bottom are becoming clearer, and the special function reduces the noise level. As a result, you get a more informative picture of what is under your boat to improve the safety of navigation and improved catches. Units issued under the brand Garmin differ as a high build quality and high performance. Speaking about the chartplotter GPSMap 1020xs, you immediately notice its gorgeous body, made in a modern way of durable and reliable materials. Large display pleases with its brightness and anti-glare - it will be seen all and in all lighting conditions, there are also lights for night work. Since Garmin GPSMAP 1020xs is one of the top devuces, it has a high performance power. The navigation, work with routes and under water scanning work without any complaints. GPSMAP 1020xs turns on quickly, and a few seconds later it is already connected to a GPS or GLONASS satellites. Ship sailing routes are built quickly, and following them is smooth - all the information is updated in real time and also applies to data received from the transducer. The transducer works perfectly - needless to say that the chartplotter Garmin GPSMAP 1020xs shows in detail the bottom bends. This information will be useful to see the dangerous areas of the reservoir, for example, underwater rocks, meeting with which is unacceptable. Tthe fish, of course, will be shown on the screen with great accuracy, also you will be able to see its moves, as all data will be instantly updated, and therefore the device can be used for scanning in motion. Motion Recording coordinate points and routes is either to external media (there is a special connector) or on memory cards that are supported simultaneously in the amount of two pieces. They must be ordered separately. Through the receiver 10Hz GPS / GLONASS, Garmin GPSMAP 1020xs updates the location and direction of travel of up to 10 times per second. Your location on the screen will move smoothly and continuously, providing incredible accuracy when marking waypoints (5,000 points) and navigation. Garmin GPSMAP 1020xs also allows you to get access to more features on the board. The device supports the NMEA 2000 format, so that you can view on the screen such valuable information as the Garmin autopilot data, motor data, meteorological data from the radar and other SiriusXM®. Click the button below to add the Garmin GPSMAP 1020xs (010-01183-01) to your wish list.